Gurdjieff gave high significance to the 'incomparable Mullah Nassr Eddin, in his, without doubt most extraordinary books ever published, All and Everything �Beelzebub�s Tales To His Grandson�; Often, when considering a very serious question, he finishes with a quote from the Mullah Nassr Eddin, which constitutes one of the best elements of Gurdjieff's humor. He has been praised by Gurdjieff, as a man who was �intelligent not in the European sense of the word, but in the sense in which it is understood on the continent of Asia, that is, not only by ordinary knowledge but by �being-knowledge�. The Mulla, as he is often called, was a satirical Sufi figure who lived during the Middle Ages (around 13th century). Some say Nasreddin is a legendary figure. Others insist that he was a real person, though the exact details of his actual life have not been proven. According to an unproven claim, the legendary Nasreddin lived in Anatolia, whereThere is a town called Sivrihisar near the city of Eskisehir where he was born. 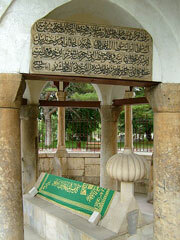 The tomb of his sister Fatima is there who has died in 1327, 43 years after his death. According to a book called "Saltukname" which dates back to 1480, he was born in Sivrihisar. Some findings indicate that he has died between 1284-1285. On the wall of his tomb in Aksheir, the date of his death is inscribed as 1383. Every year, an �International Nasreddin Hoja Festival� is held between July 5-10 in the town where he was buried in Turkey. Although There are very little proven historical facts about him, he is a well known figure in Iran, Turkey, Egypt, Afghanistan, Greece and many others middle East countries. His name is spelled differently in various cultures and is often preceded or followed by titles �Hodja� "Mullah", "Effendi or Nasreddin Hodja, or Hoca which means Teacher in Turkish. Mulla Nasrudin�s name varies according to which country he is in. 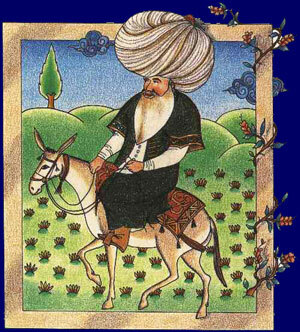 Many call him �Nasrudin� or �Mulla Nasrudin� or simply �the Mulla� or maybe even �Mulla Nasrudin the Hodja.� Azerbaijanis and Iranians know him as �Molla Nasreddin� ((ملا نصرالدين, Turks and Greeks call him �Hoja Nasreddin,� Kazakhs say �Koja Nasreddin� and Tajiks, �Mushfiqi.� In Arabic tales, he is �Djuha� or �Goha.� There are different spellings; sometimes Nasreddin is written as Nasrudin, Nasr ed-din or Nasr al-din; Molla is also written as Mulla; and Hoja as Khoja or Hoca; Joha as Djoha, Djuha or Juha, or in Egypt, Goha. His geographic area is considered a vast one, extending from the west of China and East Turkmenistan to the Balkans, Eastern Europe and up to Hungary, from Southern Siberia and the Caucasus to North Africa and Arabia. Mulla Nasrudin has a tendency of appearing foolish, but in doing so exposes other people�s foolishness with his own sharp way. He is portrayed as either very stupid or miraculously clever, or as an example to illustrate Sufi teachings.